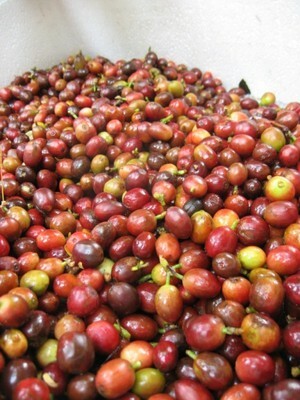 Coffea (coffee) is a genus of ten species of flowering plants in the family Rubiaceae. They are shrubs or small trees, native to subtropical Africa and southern Asia. 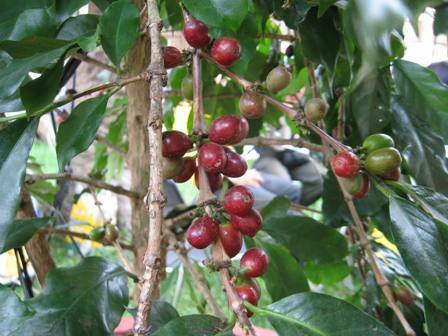 Seeds of this plant are the source of a stimulating beverage called coffee. The seeds are called “beans” in the trade. Coffee beans are widely cultivated in tropical countries in plantations for both local consumption and export to temperate countries. Coffee ranks as one of the world’s major commodity crops and is the major export product of some countries. 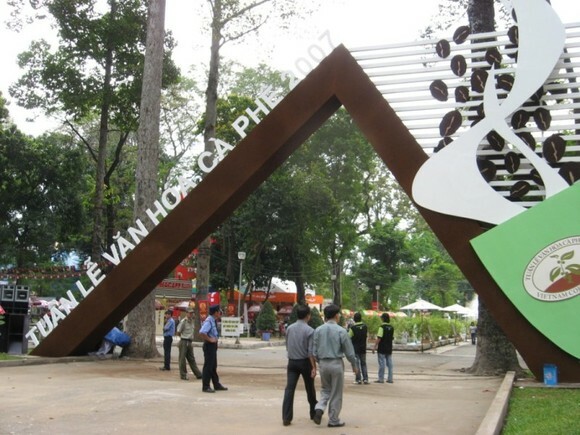 This past weekend in Saigon, there was a large coffee festival at Tao Dan Park in District 1. The event was organized by a few central highland provinces to showcase their exquisite coffee. The festival also provided an opportunity for local coffee brands to introduce their products (i.e. instant coffee) to the public. I’m not much of a cà phê drinker, but Vietnamese people in general love the stuff. The preparation of choice is cà phê sữa đá, which consists of Vietnamese coffee, sweetened condensed milk and ice. One of the highlights of the event was a giant archway made of ground coffee and coffee beans.